Wayne Rooney will savour the chance to once again sample the Celtic Park atmosphere, according to his former Everton team-mate Alan Stubbs. 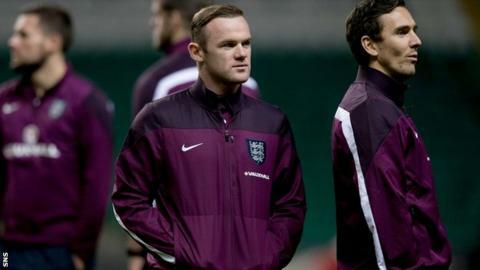 England skipper Rooney is set to lead his side out against Scotland in Tuesday night's friendly. "From speaking to Wayne and a few of the lads, they're really looking forward to it," said Hibs boss Stubbs. "Wayne has been to Celtic Park as a fan and was blown away by the atmosphere, so he'll be wanting to play tomorrow." Rooney also came on as a substitute when Manchester United drew 1-1 with Celtic in Glasgow in the Champions League in 2008. He could be a pivotal figure in Tuesday's match, and former Celtic defender Stubbs is a huge fan of the England captain, having played at Everton when Rooney burst on to the scene in 2002. "He's a winner, he wants to win every game and in every training session he wants to be the best he can be. It's no surprise that he's as good as he is," Stubbs told BBC Scotland. "His ability alone is fantastic but his appetite and desire to be the best he can be is the reason why he's so good." Stubbs worked as a youth coach with Everton before taking charge of Hibs in June, and at Goodison Park he saw midfielder Ross Barkley at close quarters. Barkley, who has been tipped to start for England at Celtic Park, has been compared to Rooney but Stubbs reckons the Manchester United forward has the edge in terms of ability. "I don't think he's a bigger talent, but he's got a lot of similarities to Wayne," Stubbs added. "He'll be the first out on the training pitch and he wants to work as hard as he can every day. "Ross had a couple of injuries early on and he did question whether he was actually going to become a footballer. But he came through it and showed great mental toughness. He has exceptional ability and could be very, very good." England go into Tuesday's match fresh from a 3-1 win over Slovenia in Euro 2016 qualifying, while Scotland beat the Republic of Ireland 1-0 on Friday to boost their hopes of reaching France 2016. And Englishman Stubbs said: "I've been thoroughly impressed with how Scotland have been performing under Gordon [Strachan]. I was there on Friday and thought Scotland were the better team. "I wouldn't be surprised at all if Scotland win the game."